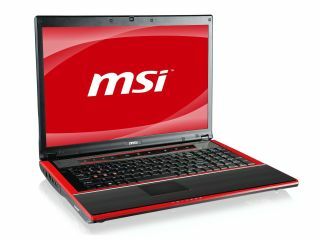 MSI has announced the release of two new Core i7 gaming laptops, with the GT740 and GT640 bringing Nvidia GeForce graphics and, of course, Windows 7. The 17-inch GT740 and its slightly smaller 15.4-inch GT640 brother come with a discrete Nvidia GeForce GTS 250M 3D graphics card, 4GB DDR3 RAM and the all important Intel Core i7 720QM Processor. Throw in a Blu-ray drive, and five SRS premium sound speakers (including a sub woofer) in the GT740 version, and you have a portable movie powerhouse as well as a gaming laptop. The GT740 weighs in at 3.4kg and the 640 2.7kg, which keeps them in the realm of portability (although you wouldn't want to be lugging them round all day), and the laptops are 'encased in a black and red alloy construction and finished with brushed metal'. Both laptops come with 640GB HDD, card reader and the usual connectivity. The MSI GT740 has a UK release date of November and comes priced at £1,399, and the MSI GT640 has a price of £1349 and is available in the UK in December.